All True Paths Lead Through Mountains: OMG! Big News! I am going to be a Forest Service Fire Lookout on Sheep Hill in Idaho this summer! Sheep Hill is pretty remote. First, you get to Elk City ID, by driving forever and three days along the south Fork of the Clearwater River, east out of Grangeville (which is southeast out of Lewiston). When you get to Elk City, you drive forever and six days out along the Magruder Corridor--a primitive? rustic? but maintained--dirt road that cuts between the Selway-Bitteroot Wilderness to the north and the Frank Church-River of No Return Wilderness to the south on its way over to Darby, Montana. An aside: a couple of summers ago, when my brother was working out in this area, they came across a dad and son. Dad asked something about how long the road is. Tim answered that it goes all the way to Montana. Kid pipes up: Montana? That's the land of sheep fuckers! 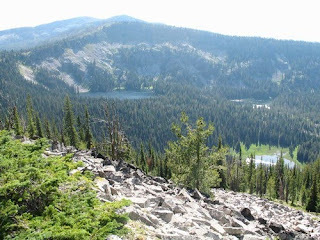 After you've driven your six days along the road to the Land of Sheep Fuckers, you get out and hike south into the Frank Church-River of No Return, 12 miles along a ridgeline, until you arrive at Sheep Hill Lookout. For your viewing pleasure, I have created a Google Map of the region. You should be able to click on it and then zoom in and out and get all interactive and stuff. Hopefully I did alright, it was my first try. It refuses to re-locate to the middle of the page. Sorry for the lack of eye-appeal. There is also a great profile of Sheep Hill on SummitPost's website, with lots of photos and information. It can be viewed here. Any additional W on this? I.e., when do you and your 5-gallon bucket of sunblock head in a direction Sheep-fuckery? And how long is your indenture? Congratulations, of course. My first day of work is May 24th, in Elk City. I will be going through Guard School and a bunch of other training, followed by such rumored fun as painting FS bunkhouses. 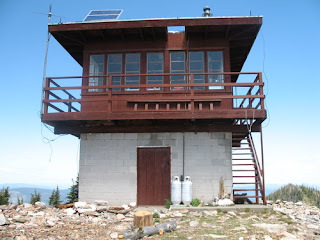 I shall then be packed in to the lookout when the snow melts out, which generally occurs in mid to late June. I will remain there until the very beginning of September, when I come down regardless of fire season, to go canoe the Bowron Lakes Chain in BC. Roughly 2 1/2 months indenture. Thanks, by the way, for reminding me of the need to purchase a vat of No-Ad. It keeps being forgotten from the shopping lists.